Join us for a brand new workshop designed to improve your understanding of human anatomy though creative drawing from the life model. 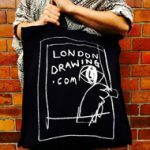 A great way to develop and improve your life drawing knowledge and observational skills. This fun and informative workshop was devised as part of a series of classes we were commissioned to run at the Wellcome Trust in response to their collections and displays. We will explore the fabric of the human body from the inside out using a range of imaginative processes, from bones through to muscles and use this to consider the physicality of the surface of the body. Not sure or need more inspiration? Take a look at some great images from our anatomy workshop with young students at the Wellcome Trust. As with all our Saturday workshops- the day includes demonstrations and lots of practical information with plenty of individual tuition- all presented in an exciting and accessible way.